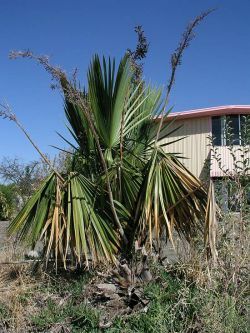 Comments: Costapalmate fan palm native to the Southern States from Texas to the Carolinas. A cold hardy palm that can tolerate some frost and cold dry weather. This is a slow growing tree that can have a trunk height to 10 feet. One distinguishing feature of this palm is the broken-in-half looking older leaves.